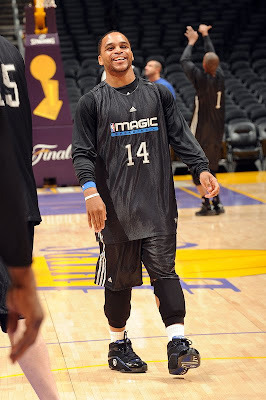 The Converse Blog: Jameer Nelson is back, and so is Converse in the NBA Finals! Jameer Nelson is back, and so is Converse in the NBA Finals! After taking a two year absence, Converse is now back in the NBA Finals thanks to Jameer Nelson returning to the Magic's line up. Jameer has been out since before the All Star game with a shoulder injury and it wasn't likely that he would return. Not much went good for Orlando last night, but if Jameer is healthy enough to play I think in the long run it will help their chances in this series. What killed them last night was their awful shooting percentage. Either way, it's still nice to see Converse back in the finals. Here are some pics of Jameer surrounding the Finals. Above Jameer is wearing some awesome Converse shorts and slides that I can't find anywhere or I would buy them. Below Jameer is at practice wearing the Converse Assist. Above is Jameer from the game last night also wearing the Converse Assist. I am holding out hope that he'll wear the Weapon EVO's at some point in the Finals, but time will tell. I've got a few tidbits to talk about here. Led Zeppelin edged out The Beatles to win the latest poll on who should get a Converse collection next. No one else was really even close, but there was a 3 way tie between Queen, The Rolling Stones, and U2. I was really off on the Eagles, but someone had to come in last place. Also I didn't use KISS because they've already had a Vans collection. I updated Weapon Wednesday two week ago, but I realize some of you may not have seen it. So I want to give a big thanks to Fernando Berdones for hooking me up with the picture of those OG Yellow/White Weapons. I got an email from a blog reading looking for info on a pair of Converse that he had back in the day. Here is what he had to say, "I bought them somewhere around 1997-1998, they were basketball model of course, mid or high (more likely mid), React, half black (in front) and the other half lf the shoe was white, and with the glowing yellow React window on the side." I've searched my pictures and I can't seem to find anything that matches this, so I am calling on all of you Converse heads for help. This man needs knowledge and pictures about this long lost shoe. Thank you in advance the information, email it to me at ConverseNCAA@hotmail.com.